Long ago, when Frank Sinatra was guesting all over radio and television in addition to host duties of his own, there was a joke he or others could reliably pull called The Kissing Bandit. 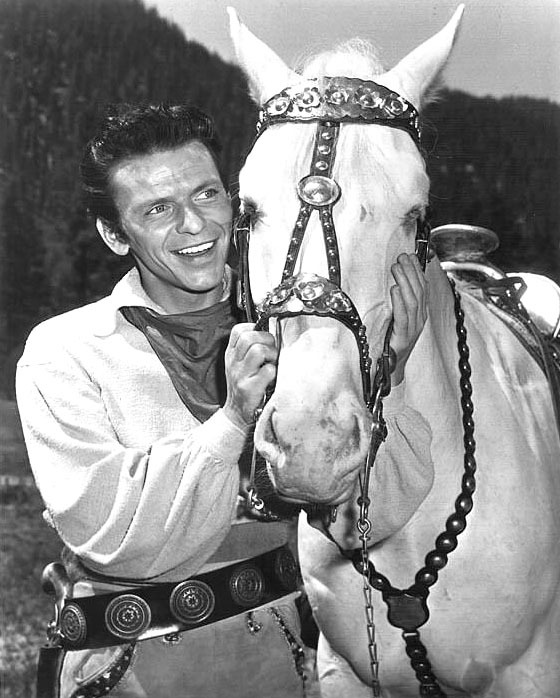 This was an old movie Frank had done for MGM before a slump and then major resurgence to make bullet-proof his stardom and allow the Voice to kid himself and past stumbles. Such was common touch even biggest names needed. We liked ... still do ... entertainers who will admit having once laid an egg. Jack Benny benefited best of all through varied flogging of The Horn Blows At Midnight, having made success in other medium to allow admission that his film career was less stellar. Sinatra after From Here To Eternity and subsequent one hit after another was similarly free to pet dog that was The Kissing Bandit and invite an audience to laugh with him and not at him. 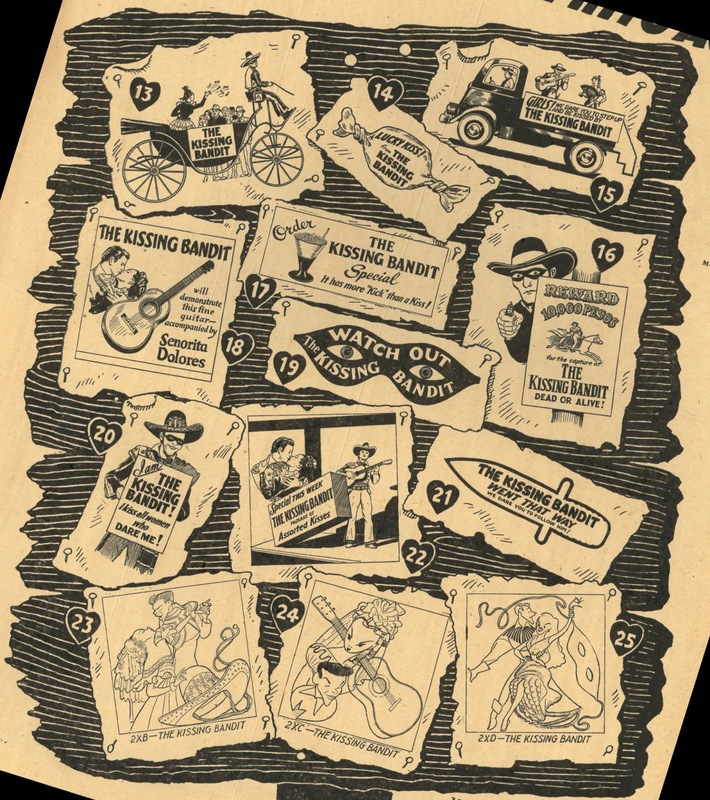 The gag was good so long as there was at least faint memory of The Kissing Bandit. 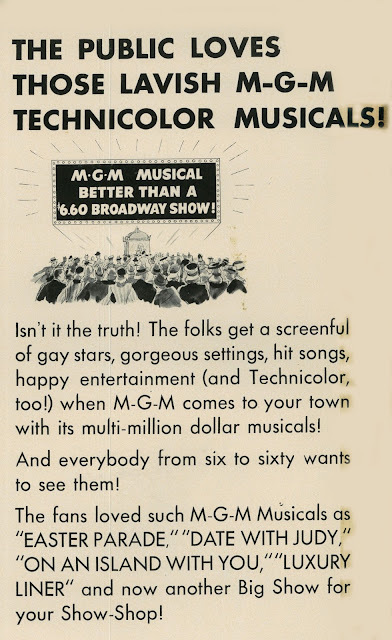 By 1974 and Sinatra co-hosting That's Entertainment, it was stale, and MGM had to face challenge of then-patronage caring about any of their old musicals. Besides, Frank was there to celebrate classic ones, including those he'd been involved with, so why mention a stain on Leo's and his own record? The Kissing Bandit meanwhile played, if at all, on fewer TV stations than had bought "Pre-48 Greats" when the MGM backlog first came available in 1956. We certainly had no access to it on NC channels after the early 60's, broadcasters opting instead for movie groups with more color. 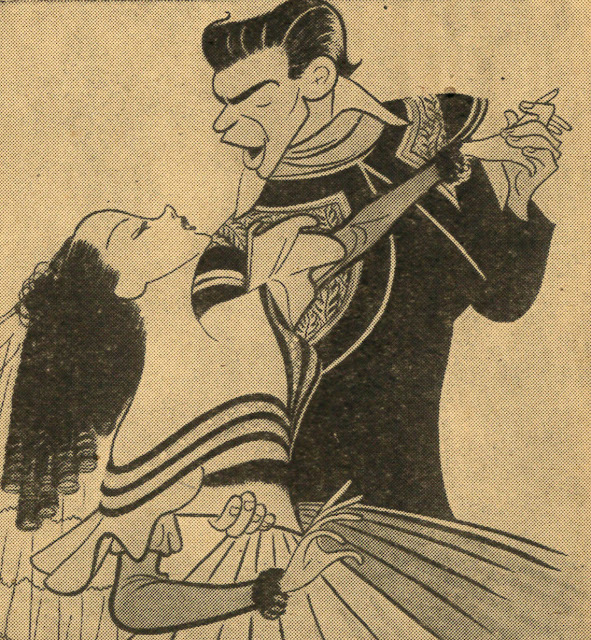 The Kissing Bandit had that, but was lumped with others mostly black-and-white. With so many more viewers buying color TV's, there would come lean times for sales folk trying to unload pre-48, "Great" or not. The Kissing Bandit was avoidable for me through a first twenty years of TCM, but I knew reckoning would come, as indeed it did recently when the mocked musical ran for a first time in HD. The Kissing Bandit looking so good might at least reduce the smell it emitted otherwise. The idea wasn't bad, even if Zorro-derived. 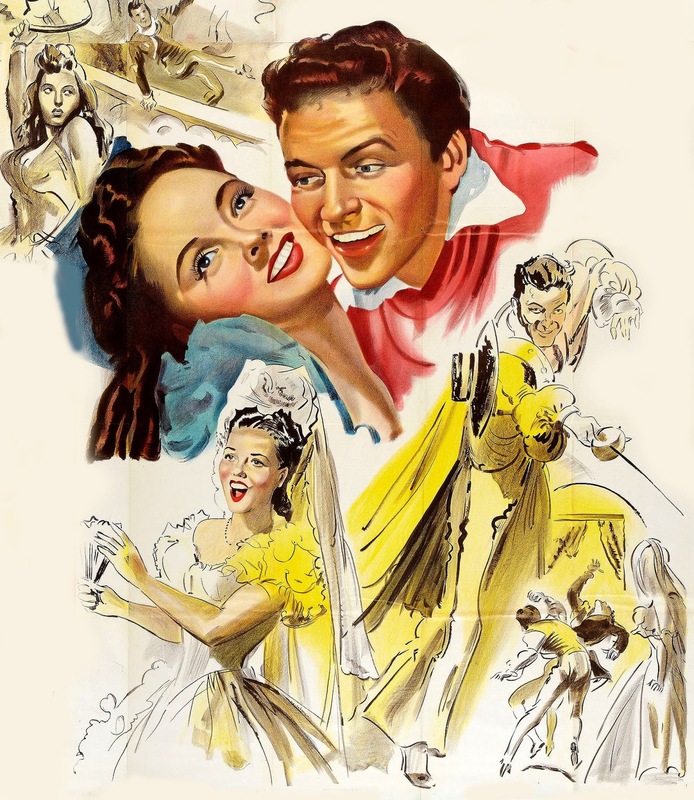 Frank is the apparent pansy son of a notorious road agent who comes home to assume mantle of his elder and kiss maidens fair, including Kathryn Grayson in trill-mode. I could see this being remade later with Elvis. Was it considered, or thought by the 60's to be too old-fashioned? (if so, then someone explain Harum Scarum) Sinatra flies off his horse and through a window in a first scene. This and other slapstick looks to be handiwork of Buster Keaton as gag consultant, him called in where MGM had physical comedy to perform. Sinatra seems suspect when in action, us taking for granted he'll be doubled when not standing still or taking flight with song. This star would need to bulk up before credibly swinging a fist or holding off armies. 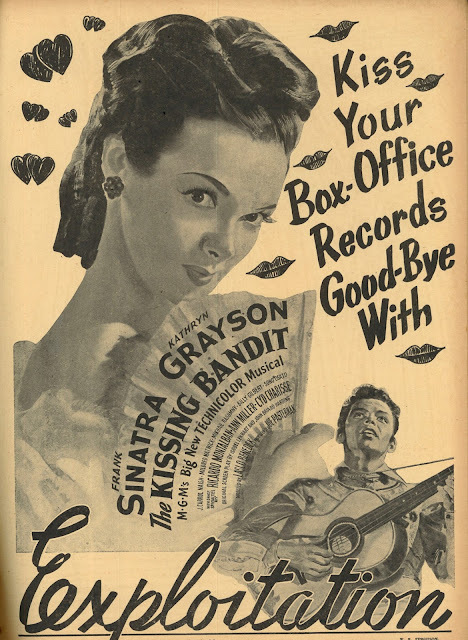 That being central joke of The Kissing Bandit is well and good, but how was it help to romantic, if not dashing, Sinatra image MGM was hoping to sell? 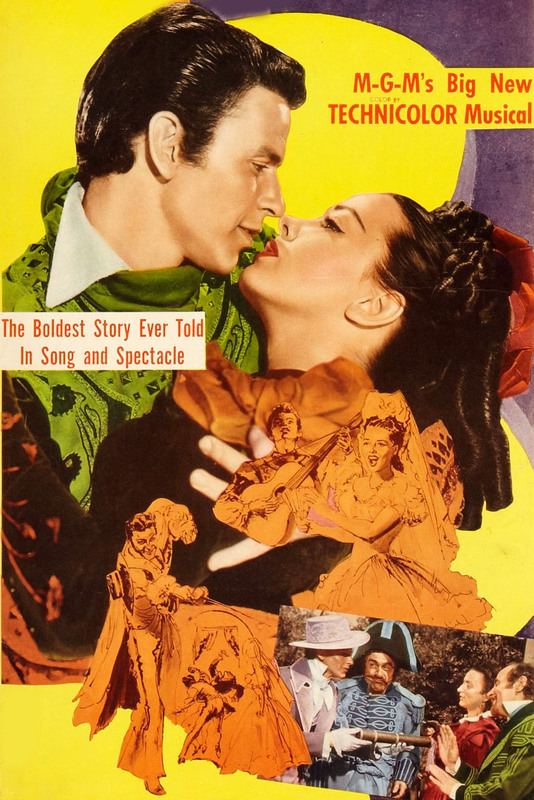 The Kissing Bandit was produced by Joe Pasternak's unit, his a tier below Arthur Freed, but decided A's, and object of MGM largess re production values and Technicolor. 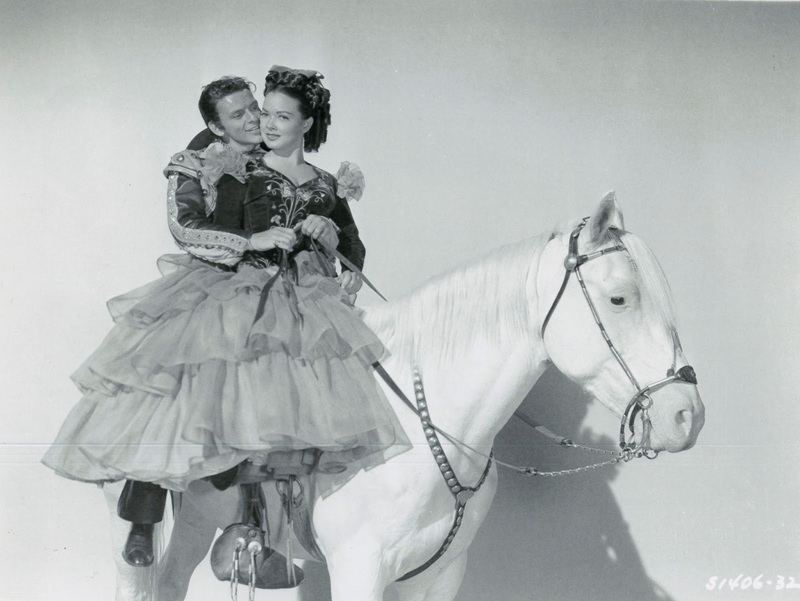 Even on said generous terms, however, The Kissing Bandit went way beyond pale, its $3.2 million negative cost a most spent by Leo during the period but for The Three Musketeers and a Freed that flopped, The Pirate. Postwar hemorrhage was felt keener at Metro for too many years they'd lived fat, with more producers it seemed than blades of grass at Culver, each drawing crazed salary for movies a public increasingly didn't want to see. It was ones like The Kissing Bandit that made New York ring the crisis bell and force Louis Mayer to look outside for someone who'd curb spending. Kissing would be, in fact, a kiss to empower Dore Schary at MGM and his policy to stop further waste of Leo dollars, embedded staff having shown no willingness to cut back. The Kissing Bandit took a horrific loss of $2.6 million, a same amount that The Three Musketeers had earned in profit. Bandit's would be the worst catastrophe on Leo ledgers until 60's blood-let of Cimarron, The Four Horsemen Of The Apocalypse, and sunk ship Mutiny On The Bounty. Frank wasn't altogether to blame, but he'd not be a lead-man for Metro again, ones left with him putting Gene Kelly ahead on marquees. Sinatra was soon enough out and away until career comeback enabled return for The Tender Trap, which did go into profit. 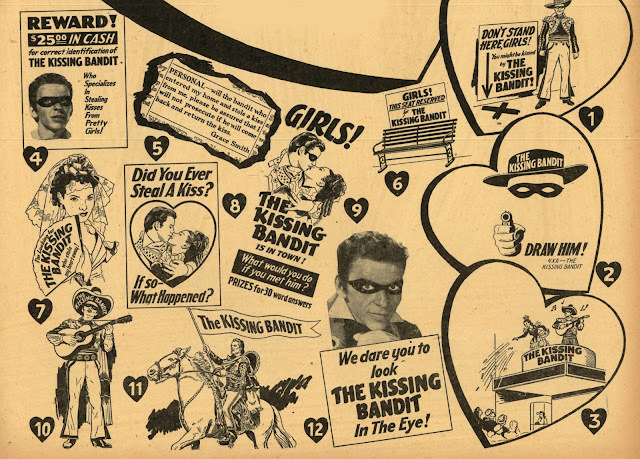 What turned audiences off of The Kissing Bandit? Receipts were dismal beyond telling ... $969K for all of US rentals, with foreign less than half that. 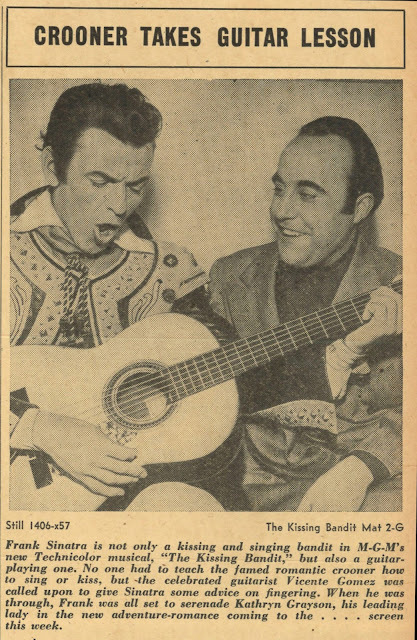 A look at publicity is telling, Sinatra in poofy costumes and strumming a guitar. He must have gagged on photo sits, or maybe Bandit was one that seemed like a good idea at the time (K. Grayson thought not, and didn't like FS in the bargain). I'm betting the sales department turned up collective nose when The Kissing Bandit landed on desks, their despair no less acute that that felt by exhibitors who'd play the thing. Warners put The Kissing Bandit on a Frank Sinatra "Early Years" DVD collection. Like other legendary stinkers, it's not so bad as repute would claim, though I'd advise wait until TCM runs it again as High-Def, where you'll have at least a visual advantage. Include me out. Thank goodness for Greenbriar, who watches stuff like this so we don't have to. Back in the 60s there was a Flintstones episode about a masked kissing bandit -- a milquetoast thief whose female victims demanded the famous rose and kiss before letting him escape with loot. Fred disguises himself as bandit to teach Wilma a lesson, etc. etc. Now wondering if they were expecting viewers to recognize the reference to Sinatra's jokes (although I don't remember any Sinatra references. The bandit was not a caricature. ).